How can I pair two bluetooth dongles together? 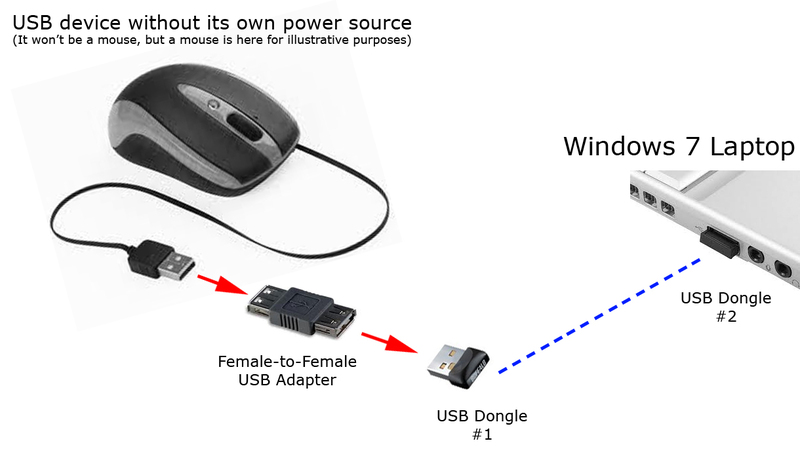 I want to hack a device which connects via USB, and plug a bluetooth USB dongle to the end of the USB cable (using a female to female adapter), and then connect to that device from another USB bluetooth dongle connected to my computer. How can I do this? It is straightforward? I don’t want to spend $30 on parts before I know how to do this. Also I think another concern is that the USB cable is providing power to the device. So I think that means I would also have to hack it for power. Note: it won't be a USB mouse, as that would be pointless because there are already wireless mice in existence. The mouse is displayed for illustrative purposes. Think for example, PS3 controller. That works, and in fact I was able to get it working with my laptop, over Bluetooth. I just want to know HOW to make it work. So now I just need someone to help with the specifics. Well, this answer might be 9 months late, but in case anyone else wants to do the same thing. Check out the hidclient project (Virtual Bluetooth® keyboard and mouse) by A. Hoffmeister. I haven’t tried it, but you should be able to take a Raspberry Pi, plug in a Bluetooth dongle, run this software and now should be all set to retransmit USB HID devices. However, I think this is limited to keyboard and mice HID profiles. If you have USB device that impliments some other profile, you would have to modify the code to handle that profile. It looks like he includes the source code, so you should be all set. USB peripherals do not implement USB host functionality. Therefore, the only possible consequence of this exact setup is that nothing will happen. Think about it this way: bluetooth isn't wireless USB. It is a protocol of its own. There isn't any bluetooth profile for passing USB through, and the mouse (or whatever) doesn't implement any bluetooth profile. What you are missing from this setup is a component which unwraps the HID protocol data from USB, wraps it in the bluetooth protocol using the HID profile (which is similar to what a PS3 controller transmits), and does the same in reverse on the other end. USB bluetooth adapters will do the HID unwrapping for the OS, and sometimes encapsulate it in a virtual USB, but they won't do the encoding. To make a thing like that happen, you would need to create a device (I know of nothing currently produced that does this) to act as a USB host adapter, extract the HID protocol data, re-encode it in bluetooth, and transmit it. If the device isn't a HID (like a keyboard or mouse), this becomes a lot more complicated. For instance, there are a few bluetooth audio protocols, but none of them correspond directly to how you would transmit audio over USB. It is similar for printers. You could probably leverage the HCRP profile to implement a generic transport. I don't think its that simple - USB host and guest modes for usb are different, the 'device' would need drivers for the usb device if it supported host mode, and from what you're saying the device in question gets power from usb, which means its a guest type device. It is not workable in any shape and form, without quite a bit of electronic engineering. A PS3 controller is designed to communicate over bluetooth as a HID device by design. It probably has a BT chip and embedded controller designed specifically for the task. You are unlikely to get a arbitrary device to work the same way. EDIT: Ok, i'll bite. Throw in a raspberry pi, gooseberry or other SBC between the device and the bt hub. Done. Its the simplest way to do it. Not the answer you're looking for? Browse other questions tagged usb bluetooth dongle or ask your own question. Could BT mouses work without USB adapter that is included with them, if the PC already has BT built-in?